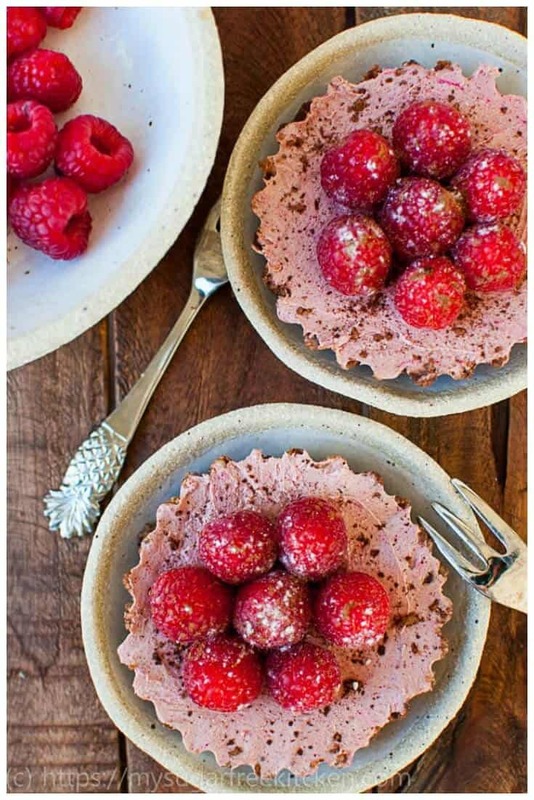 These Sugar Free Chocolate Tart with Raspberries are a rich and decadent after dinner treat that is sweet, but not too sweet. The raspberry and chocolate filling and textured chocolate base are a delightful burst of sweet, tart and nuttiness all wrapped up in those beautiful fresh red berries. It is the perfect special occasion dessert for two. 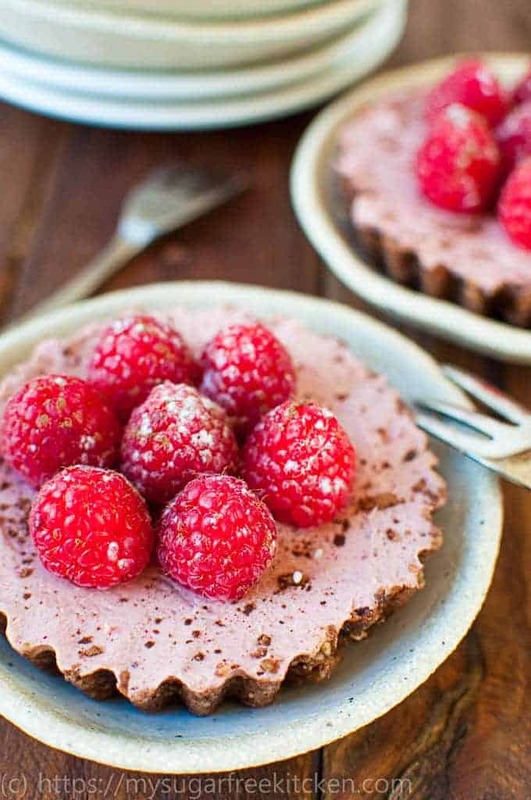 Sugar Free Chocolate Tart Is What You Need After A BIG Week! This recipe came about on the weekend as I wanted to make a “special dinner”. It had been a really busy week at work and I was a bit of a nervous wreck as our furkid Charlie had to have an operation on his neck. Since he is like the child I never had, and he gets just a little bit spoilt, I have been on eggshells this whole week as he went in for the op and then of course we brought him home for his recovery. 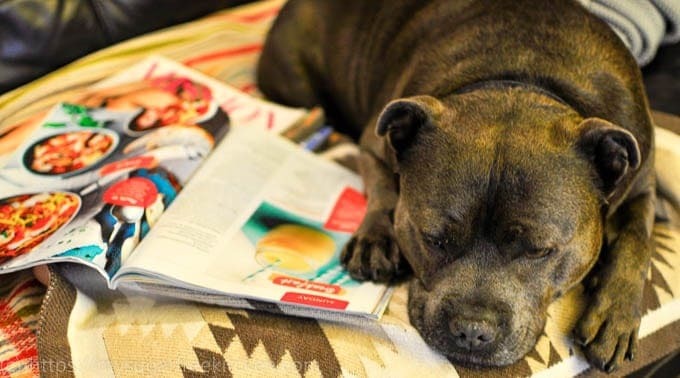 Here he is below, catching up on some reading (recipe books of course) so he can let me know what he’d like me to make next. He was a bit wonky on his feet at first, but after a day or two, it seems he has forgotten he has two inches of stitches under his neck! If only I could do the same. Anyway, so all this led me to thinking I needed some good old comfort food followed by a very good dessert, ah la chocolate tart the perfect portion controlled size! 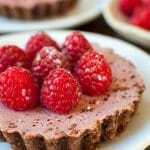 I am quite a fan of chocolate desserts, and sugar free chocolate tart in particular as they are so easy to make. The main thing you need is a food processor, or a high speed blender which would work fine. I love my food processor and find that using it makes quick work of getting the tart base done. Follow this with a quick wash, so it’s clean and ready for the tart filling. 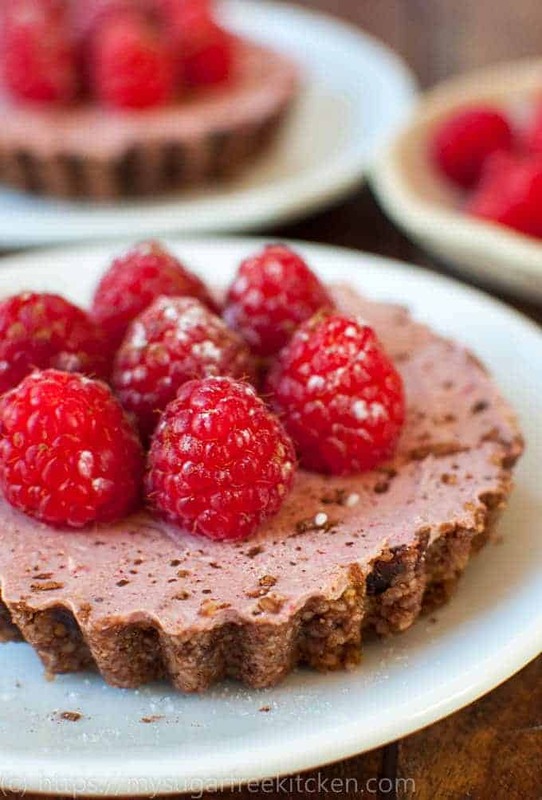 There are a couple of tips for creating the perfect sugar free tart base. The first is the sweet element. In this instance I used dates, but equally you could have used liquid stevia drops. Just note though that the drops are 300 times sweeter than sugar, so you’d have to use sparingly. Although there is a caveat here in that the consistency of your sweetener will affect its ability to bind the ingredients together, which is why I find dates so good. They are the right level of sweetness and provide enough “stickiness” to help bind. TIP: It is good to use a dry nut (eg: walnuts) and a moist nut (eg: macadamias) as this creates a good consistency – not to wet and not to dry. Adding the dates (another wet element) and then the cocoa powder (another dry element) you have the perfect balance of wet to dry to create that perfect crumb for your tart base! As for the raspberry tart filling, if you have a food processor I’d highly recommend using it for this. I used to use electric hand beaters to try and make tart fillings, and they just never had that same rich velvety thickness that you get from the using the food processor. If you don’t have a food processor, you could use a high speed blender. Basically all I do is put all the filling ingredients into the food processor and blitz until it looks smooth and silky. Usually it’s a minute or so in the food processor. 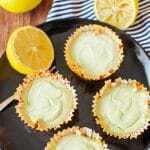 This is how I also make the creamy filling for my Sugar Free Lime Mini Cheesecakes, my Chilli Chocolate Cheesecake, this Chocolate Orange Jaffa Cheesecake and the ultimate dieters dessert – Crustless Cheesecake. 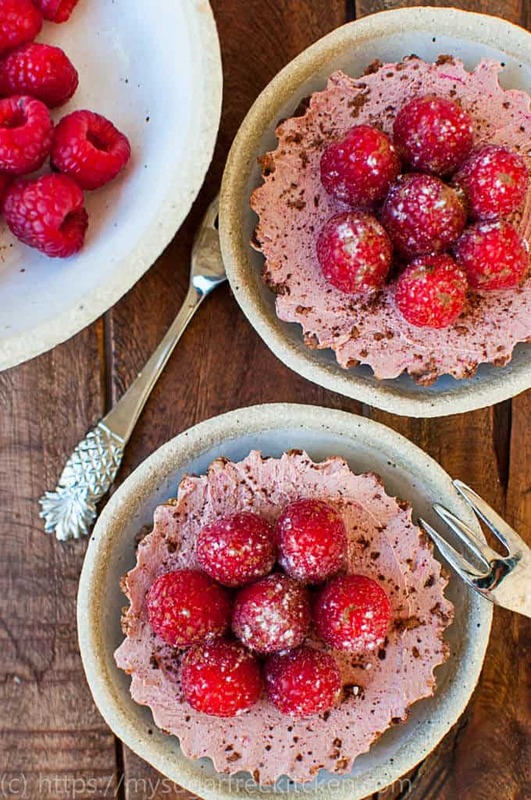 When you make this raspberry chocolate tartlet you won’t want to share it with anyone. Thank goodness the recipe makes two! 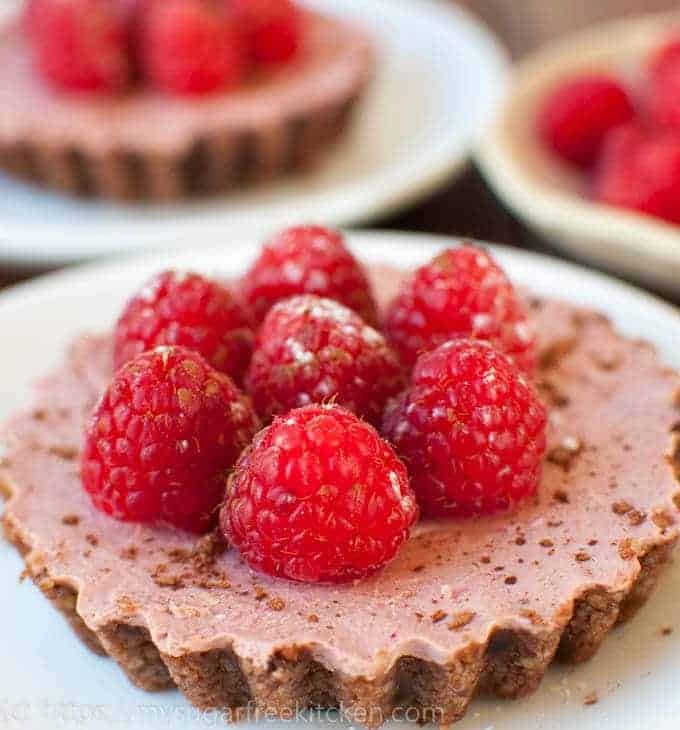 Delicious and decadent sugar free chocolate tart that are sure to cure your sweet tooth after dinner. This is the perfect wicked dessert for when you have had a week you would rather forget! Place all the ingredients for the base into a food processor and blitz until it turns into a crumb. Using 2 mini tartlet tins (with the removable bottom preferably) divide the base mixture and press firmly into the tins on the bottom and up the sides of the tin. 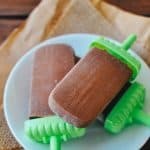 Put these in the fridge while you prepare the filling. Once clean, add cream cheese, cocoa powder, baking stevia and jelly crystals into the food process and blitz for about 1 minute until it is smooth. 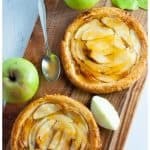 Get the bases out of the fridge and spoon filling into tart tins, levelling off the top with a knife. 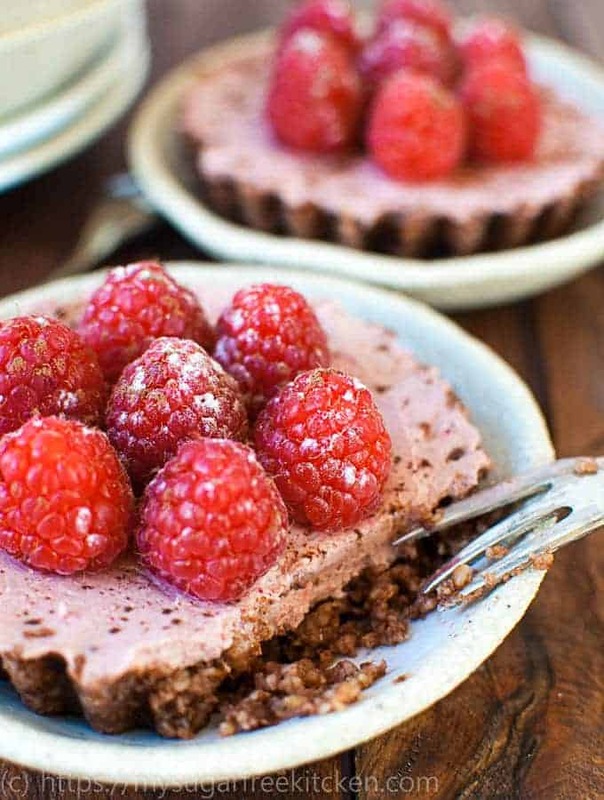 To serve, place half a dozen raspberries on top and dust with cocoa powder. This is important as it really makes this dessert special. Recommend not to skip this bit! I bought my mini tartlet tins from Spotlight in Australia. These were good to use as they have the bottom that "pops out". I find this helpful to get them out of the tin and onto a plate after they have spent time in the fridge setting.